Discolsure: Through my affiliation with Fit Approach, I received a complimentary Bulu Box for purposes of this review. As always, all opinions are my own. I’ve always been hesitant about signing up for subscription boxes. I always worry about whether or not I’ll find the items that I receive in the box useful and whether or not I’ll think I wasted my money. So when I was given the opportunity through Fit Approach to give a subscription box a try, I was extremely excited. 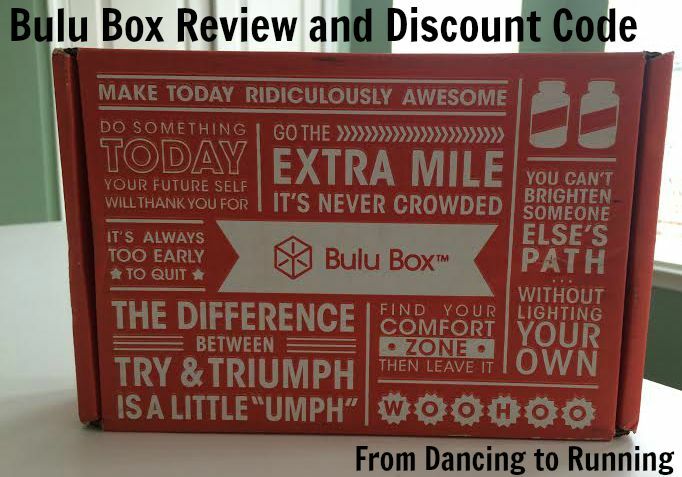 Bulu Boxes cost $10/month, and they offer a rewards program where you earn points each month that can be redeemed for purchasing full size versions of the item(s) that you liked from your boxes. My Bulu Box arrived last month, and when it arrived I immediately dove into the box, excited to find out what I received. Most Bulu Boxes contain 4-5 samples that are specifically chosen for the recipient based on the online survey that you complete when you sign up for your subscription. If you like the products, then you’re able to return to Bulu’s website and order full size versions of the item(s) that you liked, sometimes at a discounted price. The item I was most excited to try out was the Mediterra Snack Bar. I’m always on the search for healthy, easy to throw into my lunch bag, snacks, and I was excited to try out a new brand and a unique flavor without having to buy an entire box of them. While the flavor wasn’t to my liking, I still liked being able to test one out without the fear of potentially wasting money on an entire box of them. After being bitten by a number of bugs I found a need for the Earth’s Core Anti-Itch Cream. It took care of the itch only a couple of minutes after applying it to my leg. And the best part: it didn’t have that horrible menthol scent that other anti-itch products carry. If you’re looking for energy gels that are more liquidy than solid, then Island Boost might be a brand for you to try out. I prefer my gels to be more solid in nature, so this product just wasn’t for me. I regularly use an electric toothbrush, but it was still good to try out another type of toothbrush. The More T-Toothbrush is unique in that its unique shape is unlike other toothbrushes. It definitely helped in removing plague that my traditionally shaped toothbrush often has difficulty reaching. And since I’m pregnant I didn’t try the protein powder or the fiber formula. All in all, I’m glad that I stepped outside of my comfort zone and gave a subscription box a try. And the great news is that you can sign up for a 3 month subscription for 50% off using discount code SWEATPINK. That means that each Bulu Box will only cost you $5! QOTD: Have you ever tried a subscription box? What are your thoughts on them? This entry was posted in Food, Miscellaneous and tagged Bulu Box, Fit Approach, product review, Sweat Pink Ambassador. Bookmark the permalink. What a wonderful box of goodies! I haven’t gotten a Bulu Box in a while! So fun! I really liked the diversity of products that they sent me. You got completely different stuff than me! So fun! Its been fun to see the variety of products that they sent everybody. Its always good to know what works best for you. Nothing wrong with sticking with what works! You got way different stuff than I did! It’s always fun to get presents in the mail isn’ t it? The subscription boxes don’t really work for me since I am so picky about what I eat. However, the anti itch cream would have come in handy for me this summer. I got bitten a ton by all sorts of insects! I use StitchFix but I never have tried any box with food products – I do like the idea that you don’t have to “waste” money on a full size purchase to try a new food. Definitely worth thinking about! What has your experience with StitchFix been? I have yet to give them a try. I’ve never seen a toothbrush like that before. That is the great thing about these boxes, you get to try new things that you might not have without it! You got a great box! I can’t wait to get in my next one! I really liked Bulu! Hope you get some great products in your next box! I’ve been skeptical about subscription boxes too, but I got the Bulu as well and was overall pleasantly surprised! Glad to hear that you had a great experience. I did a makeup subscription before but never food. Like you I’m afraid i won’t like the stuff and then it will sit in my pantry. Honestly, this box I would have been pretty disappointed with if I had received it. The good thing about Bulu is that you fill out an online profile and they try to match the products to your preferences/needs. I have been thinking about trying this… this may have been the push I needed. Don’t forget to use the discount code SWEATPINK to save 50%. I’ve not heard of a single one of these items before. Very cool they can keep finding new things to put in the boxes. I’m impressed by the diversity of products that they include in the boxes as well. I recently read another review of Bulu Box from another blogger and I love that you each got some different products. Does that $5 price include shipping? Yes, I believe it does cover shipping. I’ve never tried subscription boxes before, but that sounds like a really good deal! I have seen some newer running ones which appealed to me, so I think I’m going to cave soon and try it out! Hope you have a great experience trying one out! Over the years, I sampled a few and was less than impressed. My all-time favorite is the PopSugar Must Have Box. It isn’t exactly fitness related but the products are always amazing and aren’t necessarily trial size. That’s awesome that they send some full size products! I haven’t had much luck with box delivery but this looks like a good one. Unusual toothbrush! I have never tried a Bulu Box so have been curious to see what was inside. 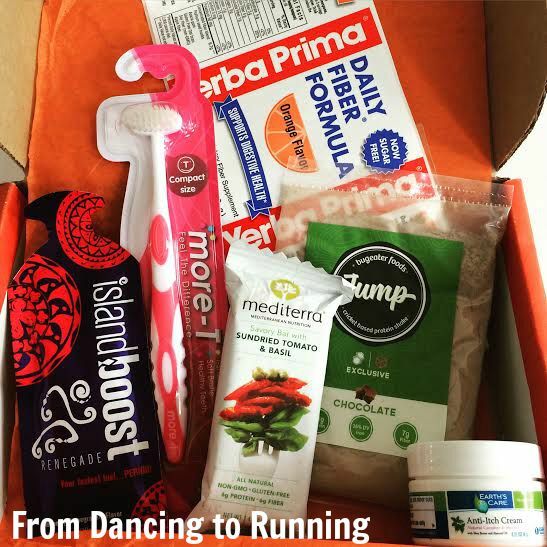 I have received a few other subscription boxes to try but have never tried one long term. Thanks for the great review! Hi Kathryn! Stopping by from the Sunday Blog Hop. Thank you for linking up 🙂 I love a good subscription box. When you find the right subscription, it’s so fun unboxing each month. Love the surprises and being introduced to new brands.